John Willingham is a regular contributor to HNN. He has an M.A. in American social/intellectual history from the University of Texas at Austin. 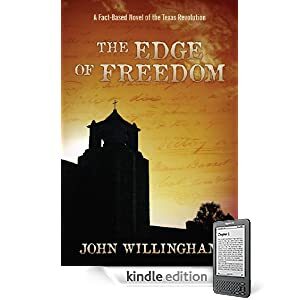 He is the author of "The Edge of Freedom, A Fact-Based Novel of the Texas Revolution." Early voting lines in Florida. Credit: Flickr/Natures Paparazzi. Twelve years after the 2000 election debacle, the newly-reelected President Barack Obama found it necessary in his acceptance speech to say that “we need to fix” the problems that continue to plague the voting process, especially in the state of Florida. Just as Florida most clearly exemplified the electoral problems of 2000, it now is the case study for an emerging set of issues that are more serious than hanging chads because they are largely the result of increased partisan manipulation of the system. In the aftermath of the 2000 election, I served on one of the national election panels convened to make recommendations for election reform. The group was formed by the Election Center, a non-partisan association of state and local election officials from across the country. Now, after that experience and even with a twenty-five-year career in election administration behind me, I make no claims to having the right answers to correct what just happened in Florida and, to a lesser extent, in other parts of the country. But I have just finished reading the Caltech-MIT Voting Technology Report, which provides a fascinating and well-written history of election reform since 2000, and I highly recommend the report as the starting point for a new effort to reform voting in the United States. Published on October 18, 2012, almost three weeks before election day, the report anticipated what actually did happen in the state of Florida. No longer is the main culprit outdated and unreliable voting systems; now the worst problems are human -- poor management and decision-making. The report does not specifically take partisan officials to task for their meddling in the voting process, but other commentators have correctly placed most of the blame on such officials whose concerns are not about voting system integrity but about limiting or channeling votes in ways that work to their partisan advantage. The most prescient insight of the report is its warning that if early voting in person is not properly coordinated with traditional, precinct-based voting, serious problems can ensue. And here is where the partisan meddling comes in. The Republican-dominated Florida Legislature reduced the number of days for early voting in person from two weeks to only eight days. Was this offset by adding Election Day polling locations? No, just the opposite. There were fewer polling locations on Election Day. Because African Americans and Latinos vote early at a higher rate in Florida, the longer lines for early voting were more likely to reduce their turnout. Meanwhile, if these discouraged voters decided to vote on Election Day, their regular polling places would be more crowded than usual, with longer waiting times. On Election Day, many polls had to remain open until midnight or later. 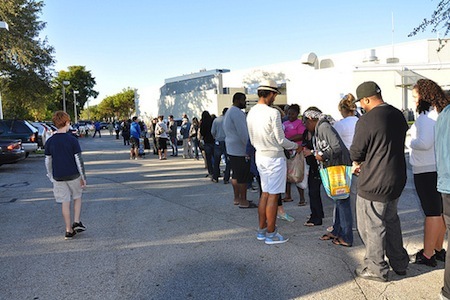 When Miami-Dade officials tried to alleviate the problem by extending hours on the Sunday before election day, they had to close their doors again because they couldn’t handle the demand. The growing national shift toward adding more jurisdictions and issues to ballots was another problem. Even after finally making their way into polls, Florida voters had to take up to forty minutes to vote multiple ballots. Meanwhile, the lines grew even longer. And the state refuses to use non-public buildings, such as large retail outlets with ample parking and space, as early voting locations. The extra space can provide more processing tables and personnel. It must be said that local officials in Florida were not in favor of the reduced early voting hours, knowing in most cases that their jobs on Election Day -- and election night -- would be hellish. Yet another problem stemming from the reduced early voting hours wasthat Democratic partisans decided to shift much of their focus to voting by mail. Voting by mail, aside from voter integrity issues that can be quite serious, depending on the jurisdiction, also slows down tabulation and results in more lost votes. The Caltech-MIT Report emphasizes that mail ballots are far more vulnerable to interception and fraud, and that they are much more likely to be challenged because of signature and other verification disputes that take up valuable manpower and processing time. The report also cites a California study showing that the number of lost votes due to voters’ mismarking mail ballots was more than two percent higher than for ballots cast in person. One reason for this is that precinct-based optical scanners can -- and should -- be programmed to reject ballots that are mismarked while the voter is at the scanner, thus giving the voter a chance to mark a new ballot correctly. On the other hand, mail ballots are counted centrally, and the voter is not present. So while we wait for mail ballots to be counted in Florida, two days after the election, let us look to election reforms that are more relevant to 2012 than to 2000, beginning with sensible, “logical,” measures to coordinate the different voting options and, above all, reduce the partisan manipulation of our most sacred right.